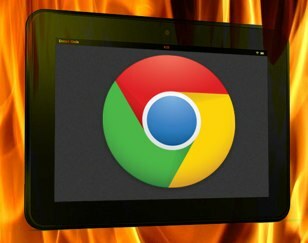 Chrome on Fire : Improve your Kindle Fire web browsing experience. Amazon's Silk browser on the Kindle Fire leaves a lot to be desired, so if you are fed up with your web browser crashing or websites not working properly you may want to check out our Chrome APK for Kindle Fire. Google's Chrome is one of the best browser options around and it works exceptionally well on Amazon's Kindle Fire. You cannot download Chrome from the Amazon App Store, but you can install Chrome easily with our APK file taken directly from Google Play. Using Chrome on your Kindle Fire makes for a more stable and smooth browsing experience as well as offering incognito browsing and a stack of other functions not available in the default Silk browser. RE: Chrome on Fire : Improve your Kindle Fire web browsing experience. I downloaded Chrome using the Dropbox method, but can't sign in to be able to download bookmarks from my other devices. Anyone know any way around this at all? Am not hopeful. To old to give a hoot! I use chrome on my tablet and Firefox on laptop, put favourite bookmarks into tablet manually, email accounts and calender sync okay on chrome with iPhone but likewise couldn't find a way to bring over bookmarks. If I'd used Firefox on tablet no doubt bookmarks would have transferred. All reviews say Chrome is best browser for tablet and so far it seems to be the case.